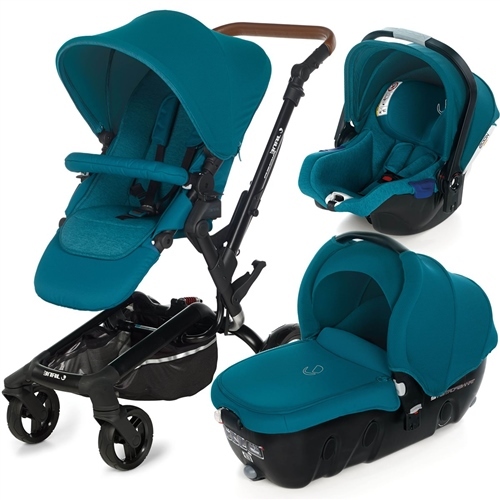 This travel system package comes with the multi-award winning Group 0+ Koos infant car seat and the Transporter 2 carrycot. PRO_FIX system (patented) locks and unlocks car seats with just one movement. Koos iSize infant car seat. Coordinating XL Muslin Cloth Set. Quick release rear wheels, PU tyres & ball bearings for maximum freedom of movement. Coordinating accessories included: Pram bag, seat liner and Muslin Cloth set. Height adjustable, soft touch handlebar (85 - 110 cm). Can also be used with seat belts if the base isn't used. Adjustable headrest to 5 positions. The headrest adjusts to suit the baby's height, and can be adjusted while your baby is still in the seat.